In a record deal worth nearly $1.4 billion, listed fund manager Dexus is set to become king of Melbourne’s CBD “Paris End” after swooping on QIC’s Global Real Estate’s prized development precinct at 80 Collins St, reports the AFR. Led by Darren Steinberg, and backed by a range of capital partners, Dexus trumped rivals Charter Hall and Mirvac, opening the way for it to begin due diligence on the project. All three candidates had tapped into their network of deep-pocketed capital partners to back their pursuit of the Collins Street opportunity offered by the Queensland funds giant QIC. Bidding on the complex deal is thought to have come in between $1.3 billion and $1.4 billion, although the end value of the precinct will rise higher as the development is completed. The site that Dexus is taking on is one of the country’s most complicated real estate assets. The 80 Collins Street property includes a 52-storey octagon-shaped tower at 80 Collins Street, formerly known as Nauru House, that is leased to private and state government tenants. Around that tower, QIC is developing a mixed-use project, comprising a next-generation 39-storey, 43,000 square metre, premium-grade office tower office, now more than halfway leased, along with a 300-room hotel and a retail complex. The project is slated to be finished in 2020. Tenants pre-committed to the new 39-storey tower include management consultants McKinsey, law firm DLA Piper, and Macquarie Bank. Law firm Ashurst is also understood to be close to signing up for 4500 square metres. Celebrated restaurateur Chris Lucas, in combination with Sydney’s Martin Benn and Vicki Wild, have been brought on board to open an upmarket eatery at the mixed-use development at the “Paris end” of Collins Street. The race for the complex was one of the most fiercely contested in this commercial property cycle and will see the property trade on a yield at around 5 per cent as investors bet that office rents will rise and interest rates will stay low, notes The Australian. The deal will likely to show an internal rate of return of about 8 per cent. 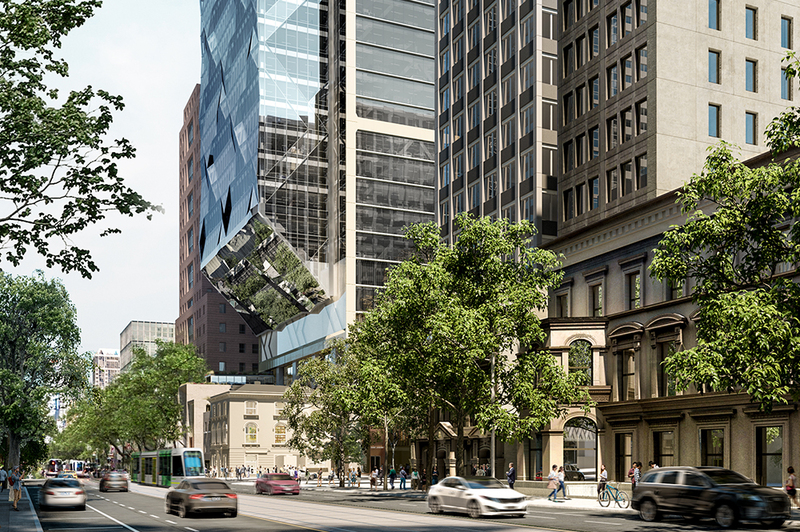 The transaction is not only one of the city’s largest ever property sales, it will also open the way for the listed group to dominate the “Paris End” of Collins Street, Melbourne’s premier office strip. Dexus recently acquired two neighbouring sites on the black adjacent to 80 Collins Street. These include the 15-storey former Reserve Bank of Australia building at 60 Collins Street for $160 million and a neighbouring building at number 52 for $70 million. These purchases provide it with a 2,000 square metre potential development site that could house a $650 million office complex, says The Age. Two weeks ago, Dexus cemented its standing as the biggest office landlord in the country after buying the remaining half share of the MLC Centre skyscraper in the heart of Sydney.